Topping marijuana is typically misunderstood by most growers. A single growing shoot might produce a larger individual cola, topping the plant gives you 4 colas that can soak up the best light intensity. The entire plant, in general, is allowed to get more light and produce bigger buds. Although individual colas might not be as large, the cumulative yield is much greater than an un-topped plant. It’s vital that you top the plants early on so that you get a solid start. When my clones take root properly and start to grow out, I cut out the meristem, which divides the plant into 2 growing shoots. Growth will slow initially, but the plant will eventually become stronger and yield more. 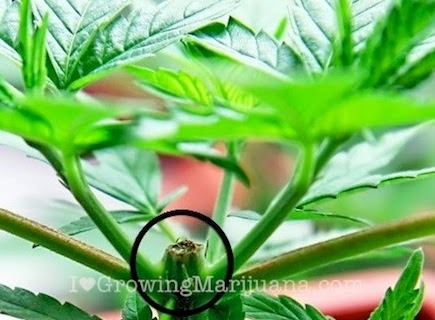 If you top low enough, the marijuana plant will create 4 growing shoots. Download my free grow bible for more marijuana pruning techniques. Although most strains take well to topping, some don’t. Really short, slowly-growing indicas like Urkle simply take a long time to grow when topped. Even so, we can usually expect 5 ounces per plant with this method. To put it plainly, all plants improve with topping, but certain slow-growing strains may take a while to mature properly. The key with most strains is to top early (around 10 inches with a few internodes). This allows the plant to keep a low profile while also providing the optimal amount of bud sites that receive the best light. Another benefit is that you don’t need as many plants to entirely fill up a room. Medical limits often make it more beneficial to have fewer plants that can give you the same yields as more plants. Seedlings are slightly different. It’s important to let the seedling develop and grow at least 4 to 5 internodes prior to topping. Topping a seedling too early will shock a plant, slow down the growth process, and waste a ton of time. A seeded plant should be given enough time to take root properly and produce a few sets of fan leaves. I generally wait until I see roots coming out of the drain holes before I top.